IDW Publishing has a new creator owned miniseries by writer D.J. Kirkbride (Amelia Cole) and artist Vassilis Gogtzilas (Adventures of Augusta Wind) called The Bigger Bang. The four issue series focuses on Cosmos, created by an inexplicable universe killing event, as he travels through space looking to atone for the sins of his birth. He soon encounters an alien tyrant that may lead him to the acceptance he is looking for. 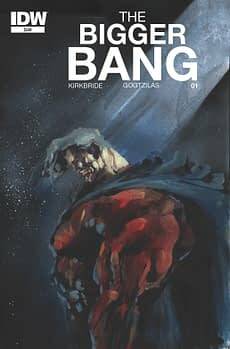 The Bigger Bang will be in comic shops beginning this November. A Comic Show – Multiversity, Delinquents, And Fade Out!